With a growing archive of at least 15,000 illustrations, famed Bond creative hub EON Productions has collated a celebratory [and of course timely] coffee table look at 53 years of 007 design. 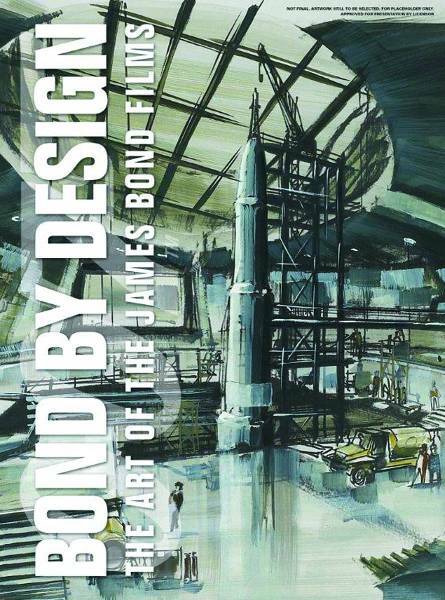 Written by EON’s Archive Director Meg Simmonds, Bond By Design – The Art of The James Bond Films is a lavish 320 page tome – as much about the unnoticed artisans of cinema as it is James Bond 007’s glorious design legacy. 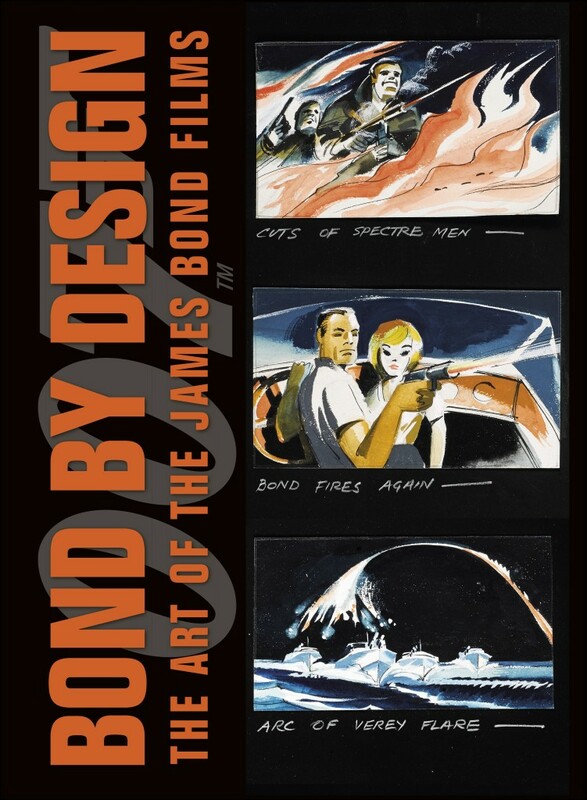 Straddling the various artistic strands feeding into the onscreen Bond – costumes, sets, graphic design, props, cars and stunts – Bond By Design explores the 007 design palette chronologically from Dr. No through to SPECTRE. As Archive Director at EON Productions, Meg Simmonds not only contributes to countless 007 books, articles, DVDs, auctions and documentaries, she has also helped curate, launch and maintain a triumvirate of Bond exhibitions. Designing Bond (which has just finished a summer run in Madrid), Bond In Motion (now parked up for a successful run in London’s Covent Garden) and the lesser known Exquisitely Evil (at the International Spy Museum in Washington DC) are all must-see branches of this ongoing project to mark and celebrate Bond’s production, sociological and cultural history. As the lushly reproduced storyboards, charcoal sketches and hand-drawn illustrations evolve into rich marker pen interiors and beautiful water-coloured vistas before making way for the new era’s digital schematics and pre-vis imagery, Bond By Design is as much a document of late 20th century movie entertainment design as it is 007 – an opulent tribute to the lost heroes of movie design. The painted ponderings of costume designer Julie Harris (Live and Let Die) are as rich and relevant as any Cecil Beaton drawing for My Fair Lady. Anthony Mendleson’s costume paintings for 1965’s Thunderball equal any Edith Head etching for those balletic frames and never-ending legs. Donfeld’s watercolour illustrations for Diamonds Are Forever’s Tiffany Case are as luxuriant and era-pinning as any Vogue Paris cover or Robert McGinnis Matt Helm poster from the same time. And check out Barbarella’s Jacques Fonteray and his Moonraker suits and “Breeder” gowns! It is telling too how the ‘house style’ for Quantum of Solace, Royale and Skyfall ‘s digitally produced designs still hark back to that pulp fiction style of paperback cover art. Of course the creative endowments to Bond and cinema from the likes of designers Ken Adam, Peter Murton, Syd Cain and Peter Lamont go unchallenged. 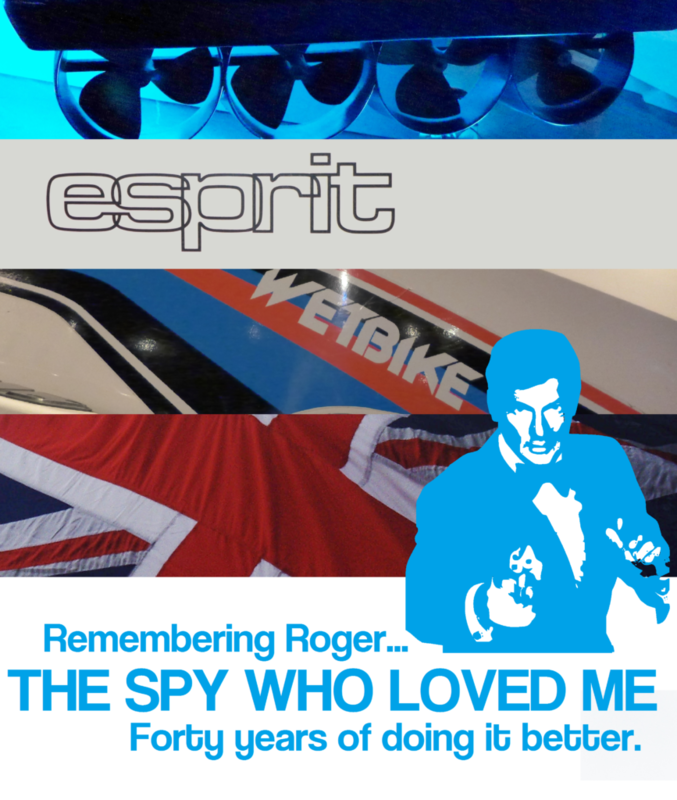 Yet Meg Simmonds and the EON archive go further with Bond By Design. The end result is a rich reserve of those sleek sketches, languid watercolours and the vital scope of ambition EON and Danjaq afford these designers. But, Bond By Design also underlines the furnishing, decorative and architectural savvy these designers had [and continue to have]. The detail and notes Peter Lamont assigns a fairly incidental set and his clear awareness of materials, light, manoeuvrability and tone is as striking as any triangular ceiling of Ken Adam’s. And this is before the internet, online libraries and catalogued furniture archives. It is not enough for these designers to know their production and construction restraints. 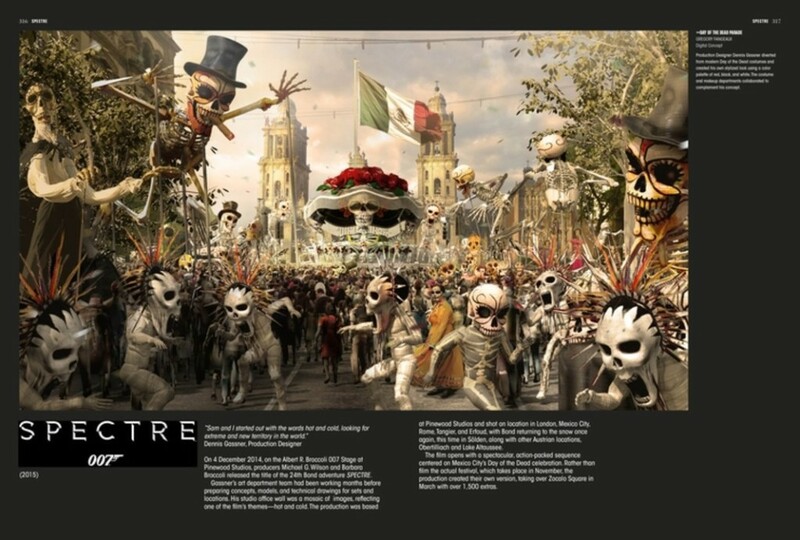 As this book testifies, they have to be ahead of fashion, erudite with what they know about the history [and future] of interior design and what will let all the global audiences into the story. And that is before you factor in the final challenge that twenty-four Bond films and their design teams increasingly come up against – originality. 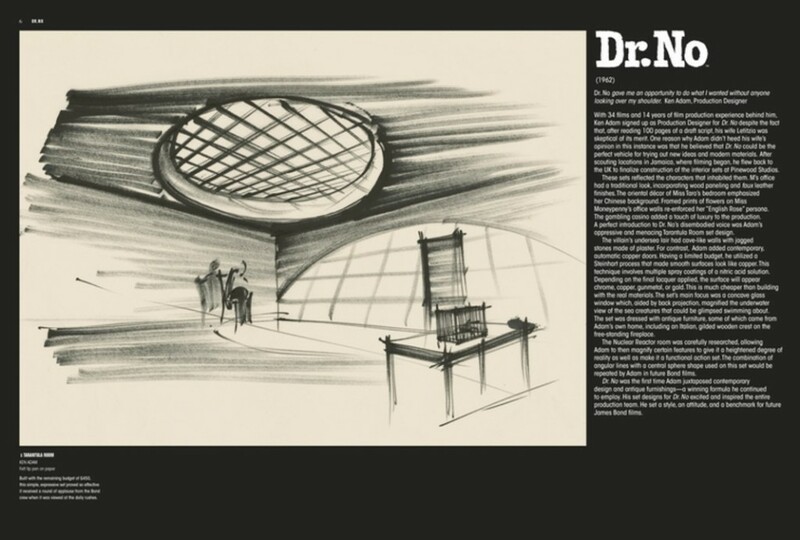 Of course these designers are all sketching for the good of Bond and cinema. But Bond By Design lays bare their own characters. Ken Adam’s thick, dark and angular images for The Spy Who Loved Me and Goldfinger perfectly highlight just how he was indeed “the man who drew the Cold War” (The Daily Telegraph, 2008). Bond By Design sees those filmic and real life influences of his – The Cabinet of Dr Caligari, Alexander Korda, that Germanistic penchant for precision and cavernous industry and a post-war, Space-Age renaissance of new materials and substances. Likewise, Peter Lamont’s career as a set draughtsman cannot be missed when you witness the mathematical precision he puts into each set, walkway or even doorframe. The devil is naturally in the detail with this collection. It is as much about what we never see as what we do. 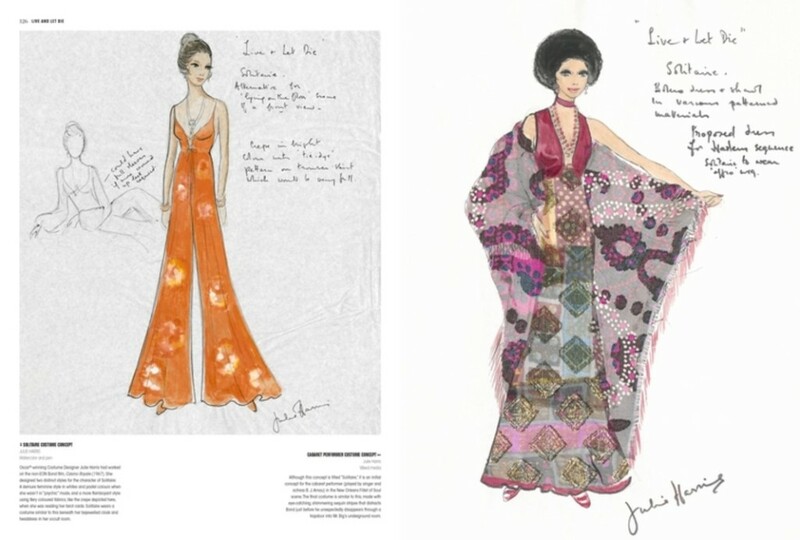 So costume sketches contain reminders that stunt teams have to wear wet-suits under Lindy Hemming’s red dresses for Casino Royale’s Vesper Lynd and notes hint at how Blofeld’s coat of arms from OHMSS must be technically wrong. The what nearly happened clues are nearly as rich as what did make its way up onto the screen. Close scrutiny of the artists notes and thoughts betray that Solitaire might well have worn an afro wig in Harlem in Live and Let Die (with a possible early thought that Diana Ross was in the running for that film? ), the scarlet hues and hanging bling of The Man With The Golden Gun’s Bottoms Up Club are now a VIP room norm, that Willard Whyte in Diamonds Are Forever may have had an unused office complex to end all office complexes, that Whyte was first called ‘Graves’, Tomorrow Never Dies’ antagonist was once called Harmsway and that OHMSS’s Syd Cain designed an abandoned dog fight for GoldenEye. Very little is creatively wasted in the Bond franchise. It is the staggering specifics that go into these drawings – and ultimately on-screen – that makes Bond By Design such a valuable document for all film lovers, let alone Bond fans. The thought and notes jotted down for a simple flower-covered pillar in a party scene in A View to a Kill or the in-depth measurements Lamont makes for the flower elevations in OHMSS lay bare the commitment to quality first pioneered and bankrolled by the likes of Cubby Broccoli and Harry Saltzman and now well and truly continued with Barbara Broccoli and the man with the most producer credits on Bond, Michael G Wilson. This is the tireless effort going on behind, in-front and beside the scenes as hardened fans panic about gun-barrel logos infinitum on 007 forums. So much is actually designed for a Bond film beyond physical sets and theatrically-minded interiors. Gold bars, the front of Baron Samedi’s train, Bond’s MI6 logo, casino chips, Martini glasses, what ornaments a villain owns, is it to be a headscarf or a necklace a panicking tourist wears are all elements that viewers will never see and yet have to be factored in, designed, made and duplicated. This writer has always been a tad partial to a good villain’s logo. And those faux-corporate emblems are lovingly presented too including Zorin Industries’ try-out logos. SPECTRE is understandably not explored in too much depth this time round as a great many of its design and visual tricks are tied to its plot and story surprises. However, designer Dennis Gassner’s discussion of director Sam Mendes’s urge to explore “hot and cold” in the film makes utter sense for a Bond movie as does the use in Mexico City of those prime 007 colours – “red, black and white”. As if it needs endorsing any more, this new champion of Bond production books also comes with a pair of glossy Ken Adam designs and a foreword contribution from Adam, Lamont and Gassner. The pen is indeed mightier than the sword. 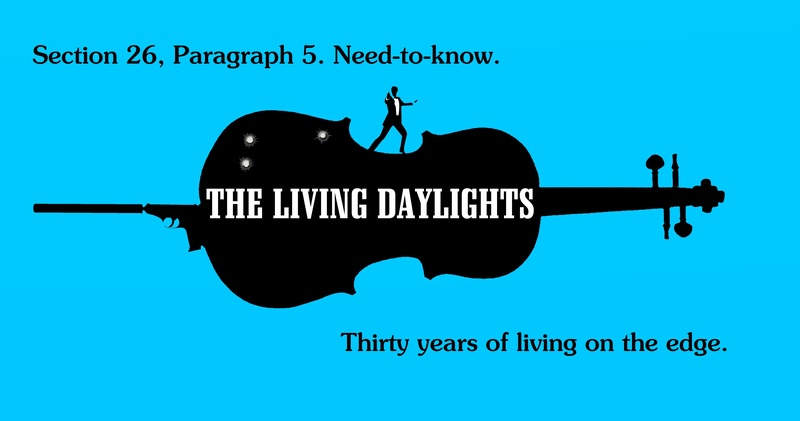 With thanks to Dorling Kindersley and EON Productions. Auric Goldfinger’s Ford Country Squire station wagon motors its charge along Main Street on a Sunday afternoon, passing the Embassy Picturehouse and pulling up dutifully at the lights. Its Mustang poppy-red and faux wooden panelling is 1960s Ford personified and the car’s wide dimensions spill into neighbouring lanes of traffic. But this is not America. And the car’s fictional owner Auric Goldfinger is not at the wheel. Nor is his fictional chauffeur, Oddjob. 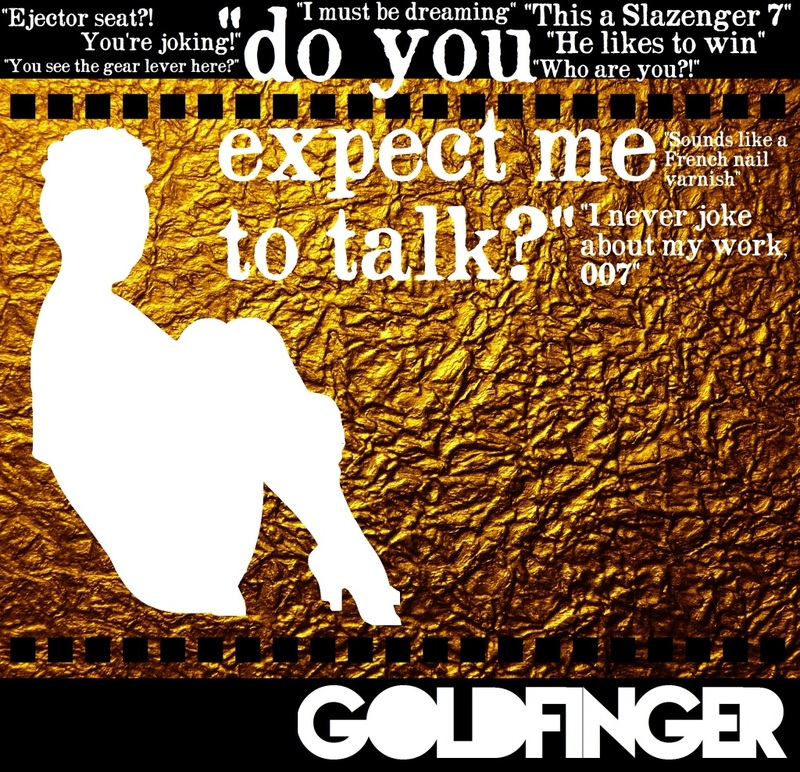 James Bond is not even sat captive on the back seat as he does in Goldfinger. This is Esher, Surrey. The year is indeed 1964, but Jimmy O’Connell is driving, his wing man is my Uncle Gerald and my dad, John, is sat in the back. The locals frequenting the pubs of Esher – including Jimmy’s much-loved The Bear – are most intrigued by the left-hand drive and Yankie expanse of the Ford …. and how it handles “like a tart’s waterbed on wheels”. Not very James Bond.